I have been suffering for a while with bad Sinus infections. They would normally happen a few times a year and they would really knock me for a week or so, resulting in a course of Antibiotics to clear the infection. I decided that I had to do something about it so I made an appointment with the Allergy and Treatment Clinic. I wasn’t quite sure what to expect but I went through the various tests and discussed the outcomes. So it turns out that my digestive system was pretty shot from all of the Antibiotics. It had never occurred to me to take a dose of probiotics to help build up my immune system again! I was also drinking way too much Coffee which was having a bad affect on me. To top all this, I was Lactose intolerant! So what was the Treatment? Supplements to treat build up the digestive system again and Clean Eating. 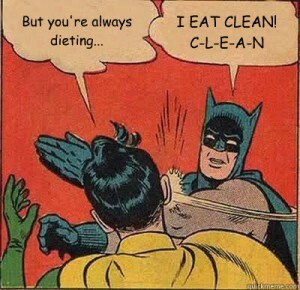 Clean eating for me means cutting out all dairy, all refined foods, all high sugar foods (Especially Milk Chocolate, which I was a bit addicted to) as well as well as any stimulants like Coffee. I have been at it just over too week now and I am really seeing a benefit. My weight is obviously dropping but the big thing I have noticed is that my energy is “more even”. I am not getting big slumps where I am just too tired. I also have a lot more energy and stamina when I am running.